Lawmakers have proposed pesticide-free zones around schools and daycare centers. Environmental and community activists say they fall short, given pesticides’ reach and persistence; pesticide manufacturers say they're unwarranted. Tens of thousands of California children attend schools located within a quarter mile of a farm field where pesticides are used. Now the state’s Department of Pesticide Regulation (DPR) is proposing the first regulations that would restrict this use. California produces about half of all fruits, vegetables, and nuts grown in the United States, so environmental health advocates argue that the children in question are being exposed disproportionately to these chemicals, simply because they live in farm communities. The proposed regulations would bar spraying pesticides—from aircrafts, sprinklers or otherwise—within a quarter mile of all public schools and child daycare facilities from Monday through Friday between 6 a.m. and 6 p.m. They would require growers and others applying pesticides at these locations to notify schools and daycare centers 48 hours before the application actually occurs. Schools and daycare centers would also have to be told the names of pesticides being used; where, when and how they’ll be applied; and given a map of the location. While this sounds thorough, environmental and community activists say the regulations don’t go far enough in their protections. At the same time, the California Farm Bureau Federation and the Western Plant Health Association, which represents agricultural chemical and pesticide producers, oppose the proposed regulations, saying they are neither realistic nor based in science. “A host of studies have shown that pesticide poisonings occur at distances well beyond a quarter mile. 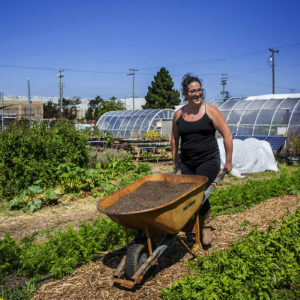 And part-time buffer zones do little to reduce long-term, chronic exposure,” said Californians for Pesticide Reform co-director Sarah Aird, in a statement. In fact, according to the California Environmental Health Tracking Program (CEHTP), not one of the top 10 pesticides used within a quarter of a mile of California schools lasts less than eight hours in the air, according to the U.S. Environmental Protection Agency (EPA) criteria. “In communities that don’t have adequate recreational facilities, school grounds are used very heavily on the weekends,” California League of United Latin American Citizens state president Dave Rodriquez told Civil Eats. Rodriguez described a high school where he lives in Ventura County that is “surrounded by agriculture on all sides.” One-quarter mile, especially when the wind is blowing, “is not very far away,” he explained. “Schools need at least a one-mile buffer for the most hazardous pesticides,” said Aird, echoing what many activists have been saying. The law would still allow a 12-hour window for pesticides to be sprayed every weekday, and that timing is key, says Dennis. 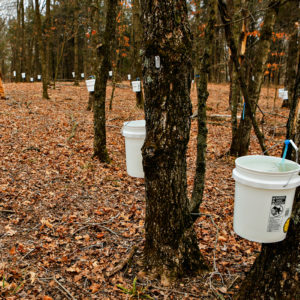 Based on what’s written on many pesticide labels, “It would be preposterous to think that they could be applied at 6:00 in the morning and that it would be safe at 8:00,” she adds. Many pesticides used near schools make fields unsafe to enter for at least a day—sometimes five days—after they’ve been applied. Both Dennis and Rodriguez are troubled by how many children in their local schools have asthma and learning problems.They’re also concerned that these pesticides predominantly impact Latino children, who make up the majority of kids going to schools near ag fields. The schools Dennis and Rodriguez describe are far from unique. According to a 2014 CEHTP report, about 1.4 million students attend over 2,500 public schools in the fifteen California counties with the highest reported pesticide use. 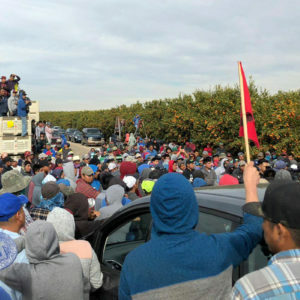 These include Monterey, Fresno, Tulare, Ventura, and also Kern County, where some schools sit less than two car-lengths away from vegetable carrot fields and almonds and grape orchards. One such school is surrounded by agricultural fields on all four sides. The report found that more than 500,000 pounds of pesticides considered “of public health concern” were used within a quarter mile of these schools. While some schools in these counties were not close to any pesticide use, 36 percent of them were. And that use was often heavy. The top 5 percent of affected schools—45 schools attended by more than 35,000 students—had seen between 2,600 and 29,000 pounds of pesticides used annually within one quarter mile. These pesticides included carcinogens and reproductive, developmental, and neuro-toxicants. They also included pesticides that persist in the environment between one to 1,000 days, with most lingering from between one and four weeks. The California Farm Bureau (CFB) and Western Health Plants Association (WPHA) take issue with DPR’s preventative approach. 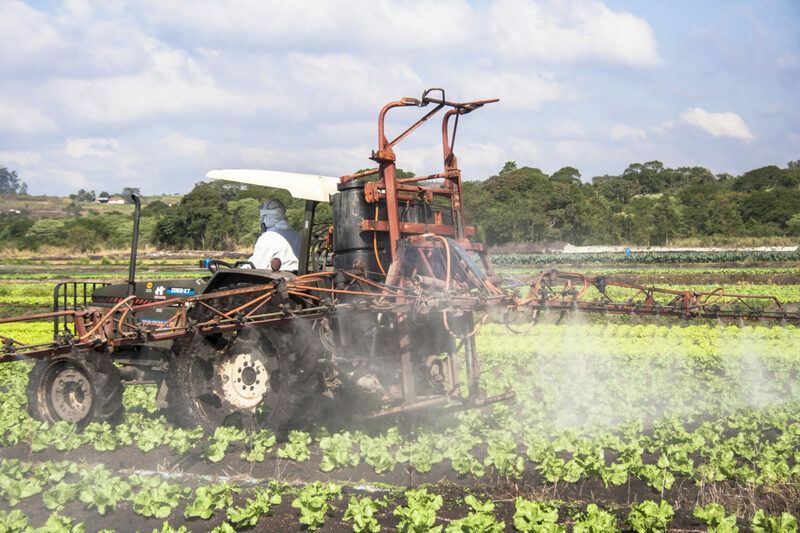 “One of our concerns is that this is a large departure from how we’ve traditionally approached pesticide regulation,” CFB environmental affairs director Cynthia Cory told Civil Eats. WPHA president and CEO Renee Pinel echoed these thoughts over email. Because the regulations are not “based on data demonstrating that children are potentially at risk under current regulatory protections,” they are “not science-based,” she said. Despite the fact that the DPR is forgoing the traditional risk assessment process, the department does cite studies showing illnesses at California schools caused by pesticide drift. It also points out that such illnesses have occurred more than one quarter of a mile from the pesticide application. In addition, says DPR, such illnesses may be underreported. Meanwhile, Pesticide Action Network North America and Center for Environmental Health, among other environmental groups, say this same science shows DPR’s proposal to be inadequately protective. WPHA says California state air monitoring data show no acute or chronic pesticide exposures for children. But, according to DPR, these data indicate some exposures of ongoing concern, including exposure to a carcinogenic fumigant commonly used on almonds, carrots, grapes, and strawberries, among other crops. Ironically, the DPR recently announced new rules that will allow greater use of this pesticide in some places. WPHA’s Pinel also says the proposed school buffer zones could lead to more crop production being moved offshore. “What I would love to see,” says Dennis, “Would be organic buffer zones around schools. How beautiful it would be to take a field trip and pick strawberries or almonds and talk about life cycles and seeds,” she said. But for now she worries about her students dealing with chronic health problems and learning disabilities. Public hearings on the new rules are scheduled for November 15 and 16. The public comment period closes November 17.